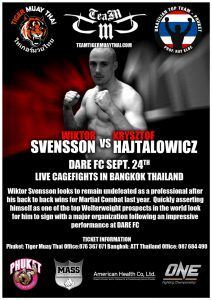 Tiger Muay Thai and MMA training camp, Phuket, Thailand team fighter Wiktor Svensson is currently one of the top Welterweight prospects not fighting for a major promotion. After going 2-0 on ESPN STAR Sports last year in Singapore, Wiktor watched his professional MMA record stay perfect at 3-0. Sept. 24th, the Brazilian Jiu Jitsu Purple belt and assistant MMA Instructor at Tiger Muay Thai will be facing Chris Haja of Poland in a superfight for the DARE FC event at Club Insomnia in Bangkok. With an impressive showing, Wiktor is expected to sign a multifight contract with Asia’s leading MMA promotion One Fighting Championship. 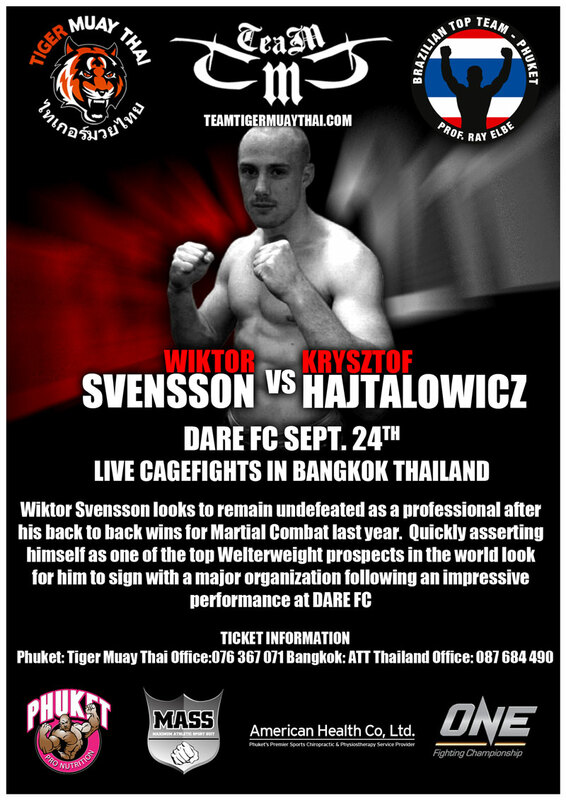 Guest of Tiger Muay Thai looking to support Wiktor at his fight are encouraged to speak to Joey or Phillippe in the office to RSVP their spot in the crowd!